Tomorrow, May 23, Maroon 5 will perform all their hits at the SMX Convention Center in Pasay, Metro Manila. 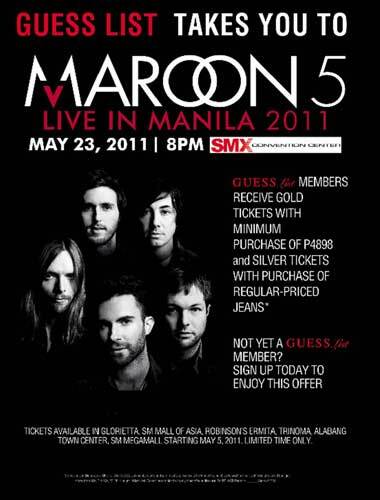 And, GUESS List members at participating GUESS stores, like Glorietta, Mall of Asia, Robinsons Place Ermita, TriNoma, Alabang Town Center, and Megamall, can get tickets through the "GUESS List takes you to MAROON 5 Promotion"! They're giving away Gold and Silver tickets exclusively to GUESS List members. A minimum purchase of P4,898 entitles you to a Gold ticket, while just a pair of regular-priced jeans will earn you a Silver ticket to the concert event of the year. If you are not a GUESS List member, you can simply make a purchase of P3,500 or more to get yourself a Silver ticket and a GUESS List Loyalty Card. This incredible promo lasts until tickets last! Hurry and join the GUESS List now to enjoy more exclusive privileges from GUESS.